You made your presentation design with a default template that came installed with PowerPoint (or worse, you used some dated PPT presentation theme you found for free online). As the overhead screen lights up, you realize that your presentation is going to come across as boring, unprofessional, and maybe even a bit cheesy. 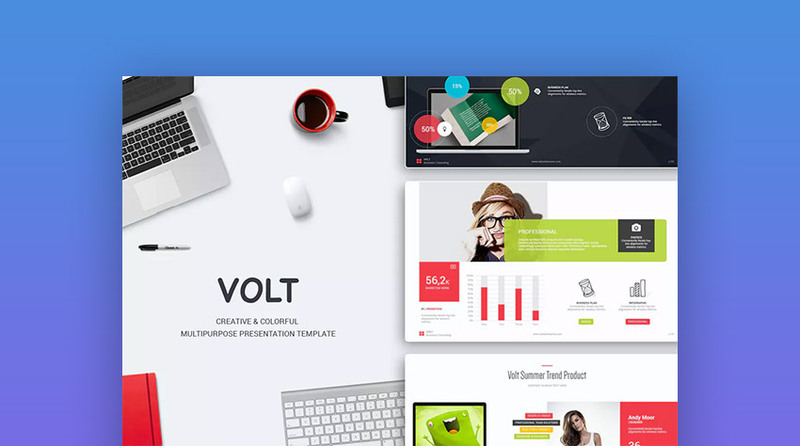 Volt – One of the Best PowerPoint Template Designs that is trending in 2019. If you’ve got a compelling idea to present, with intriguing concepts to visualize, then you need a PowerPoint design that’ll feature your message with clarity and impact. 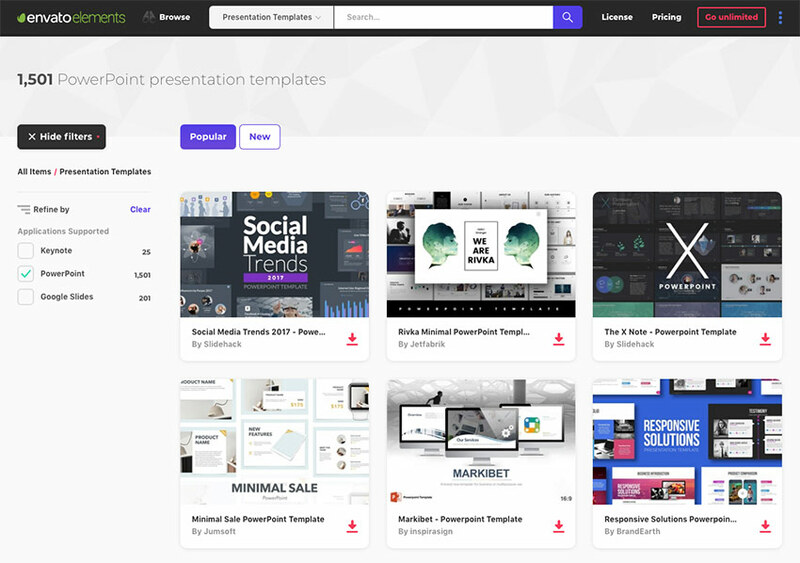 There are hundreds of great PowerPoint presentation template designs on Envato Elements, with a great offer: download as many as you want (with unlimited use) for one low price. Top PowerPoint PPT design templates on Envato Elements – with unlimited access. These fresh PowerPoint presentation designs have the right content structure, modern color schemes, unique creative details, clean typography, and a current look and feel that’ll transform your ideas into a great presentation in 2019. 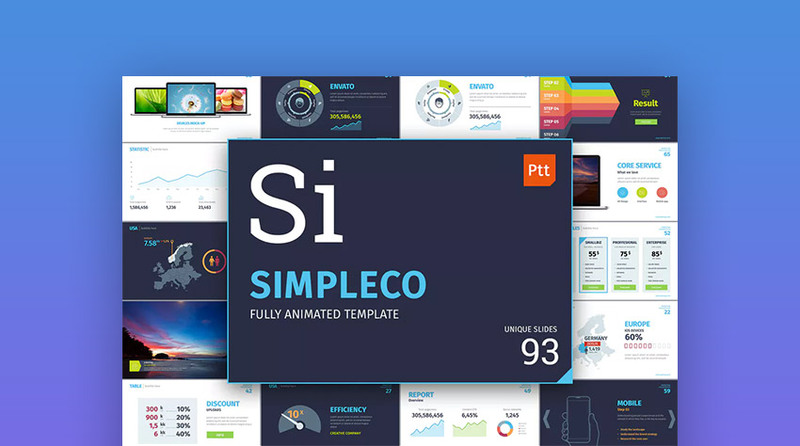 Hundreds of popular PowerPoint presentation design templates on Envato Elements. Just add your inspirational presentation ideas to these well-crafted PowerPoint template designs. Make use of these stylish PPT slides that come with visually-impactful layouts, creative graphics, well-integrated data designs, and more. Quickly prep your PowerPoint layouts with your unique info, insert key assets, and add engaging graphics, so you can present a visuals story that’ll move your audience. If you need to design a presentation in 2019 with bold ideas that stand out, then look no further than Cleira. It comes with over 150 modern slide designs, and well-balanced layout options, that’ll help you present your message with clarity. Whether you need to showcase new product images, highlight your company’s story, or present with pro infographics, Cleira has your covered with creative presentation assets and current designs! 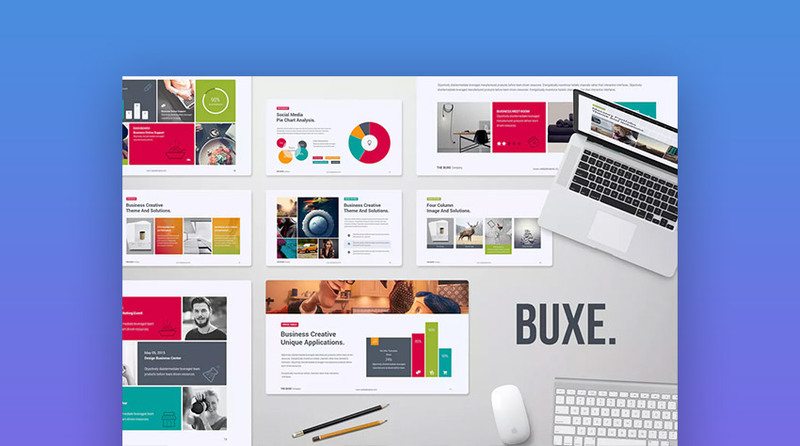 With a confident look and clean, creative slides Buxe is a highly-versatile, flat design PowerPoint template. It has a modern style that blends plenty of colorful graphics, powerful charts, and minimal design elements. 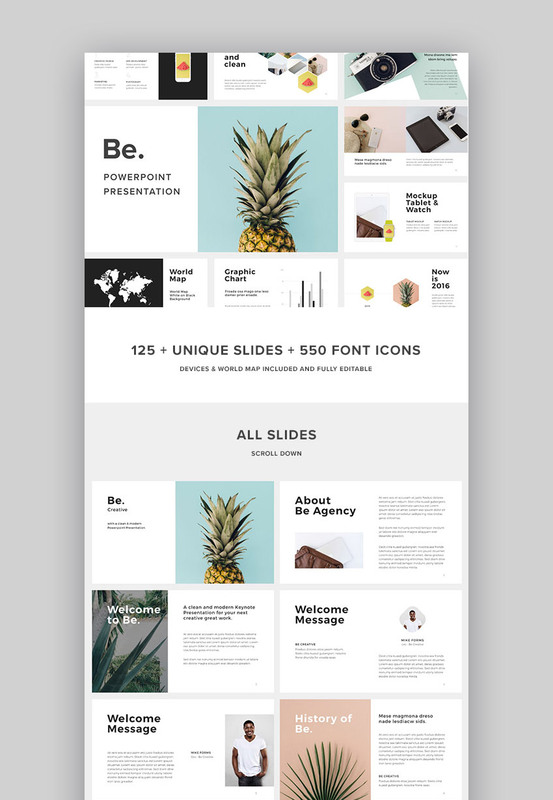 This Premium PPT design template is ready to make many types of presentations with—and to customize fast. Use it to design a fresh presentation in 2019 that’s both beautiful and highly functional. 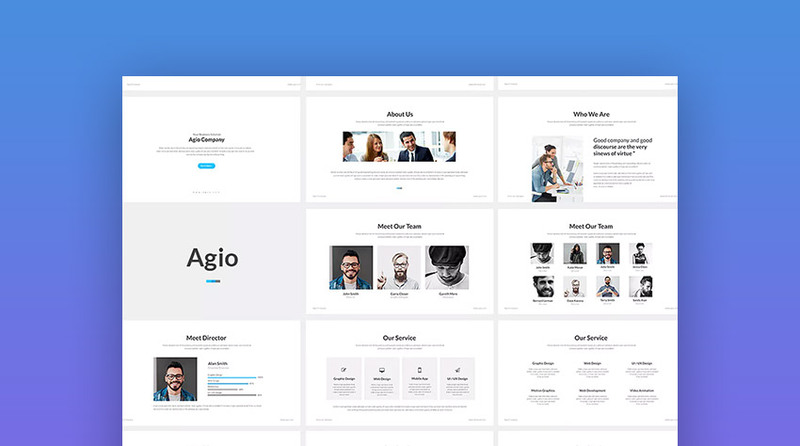 Need a presentation design template with a modern style? One that’s easy to customize? And comes packed with the right slide designs to communicate your message effectively? Look no further than The X Note. It’s made to turn your ideas into persuasive and compelling presentations. From driving thought leadership to sales presentations, this theme will exceed your expectations. 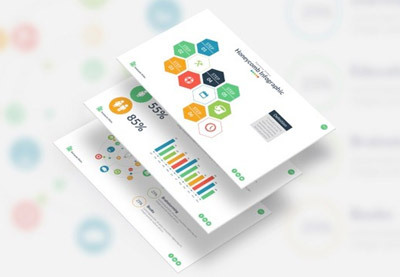 This is a minimal PowerPoint presentation design with plenty of template options built in. If you’ve got important information to present, this set delivers. It’s perfect for personal or corporate use. And comes with a ton of easy to edit features that are 100% customizable. Think big and get ready to go bold with this modern PowerPoint design theme. It has a powerful set of unique PPT slide designs that’ll help your message stand out. It features eye-catching layouts that mix striking images, with compelling layouts and confident type. It also includes quick to work with components that pack a creative punch. If you’re thinking of using one of the free PowerPoint design templates available online, you may want to reconsider when you see what you’re missing out on with this Premium PPT theme. 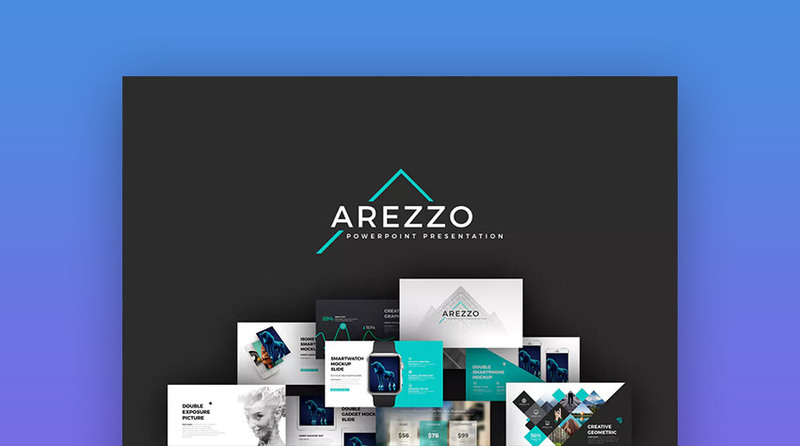 Arezzo is a professional set of slide designs, with multiple unified color schemes, and a truckload of awesome options. You can not only design a great presentation with it rapidly, but also use its built-in animations to add some elegant slide transitions. 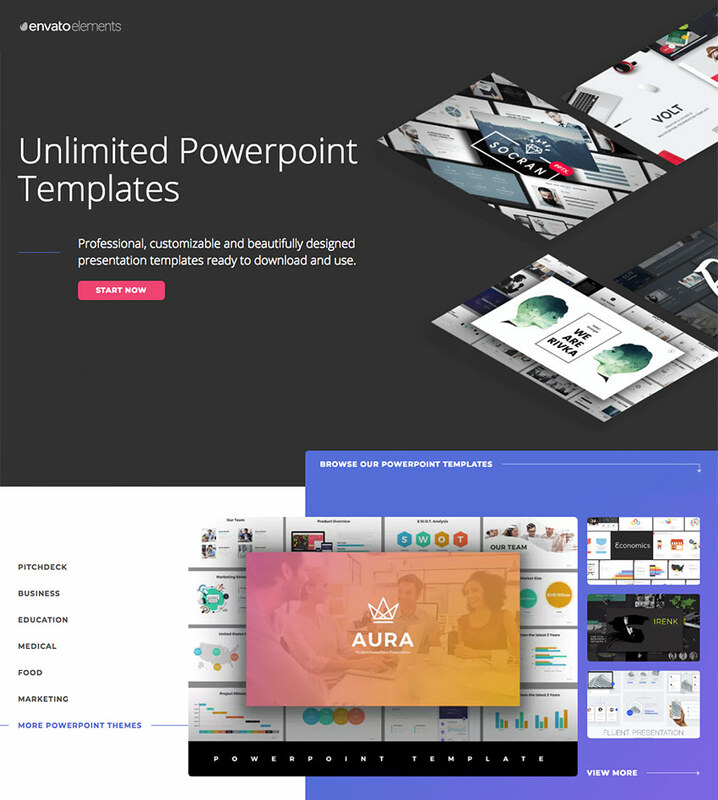 This colorful presentation design PowerPoint template is on-trend for 2019. It’s popular to download on Envato Elements and comes with clean, modern slide designs that balance infographics with vivid illustrations, bold graphic elements, popping photo setups and integrated text. Is it time to present your new business concepts, cover noteworthy trends, or present your radical product innovations? 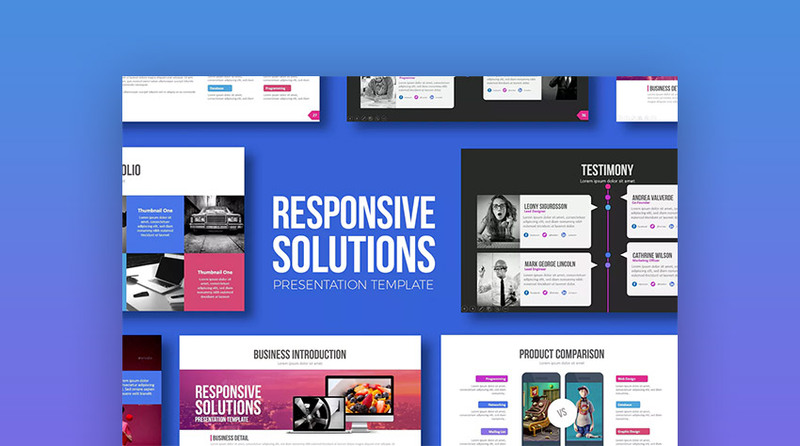 There’s a lot of benefits to using the Responsive Solutions PowerPoint template in 2019. It has a modern, flat design style that combines simple shapes, with cropped photos, clean font use, and plenty of creative components. It also packs in 60 flexible slide designs to build your presentation with pronto. 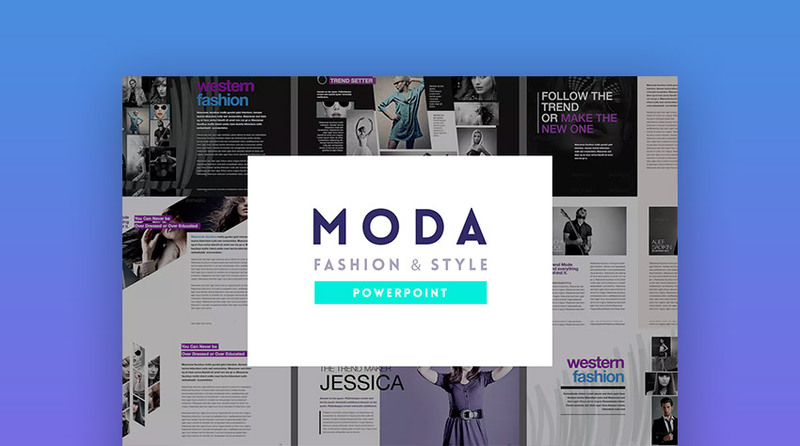 If you’re presenting on a fashion-forward topic that needs to be on-trend for 2019, then a Premium designer PowerPoint template is a must. Moda is made for high-fashion and to help you deliver a sophisticated presentation. 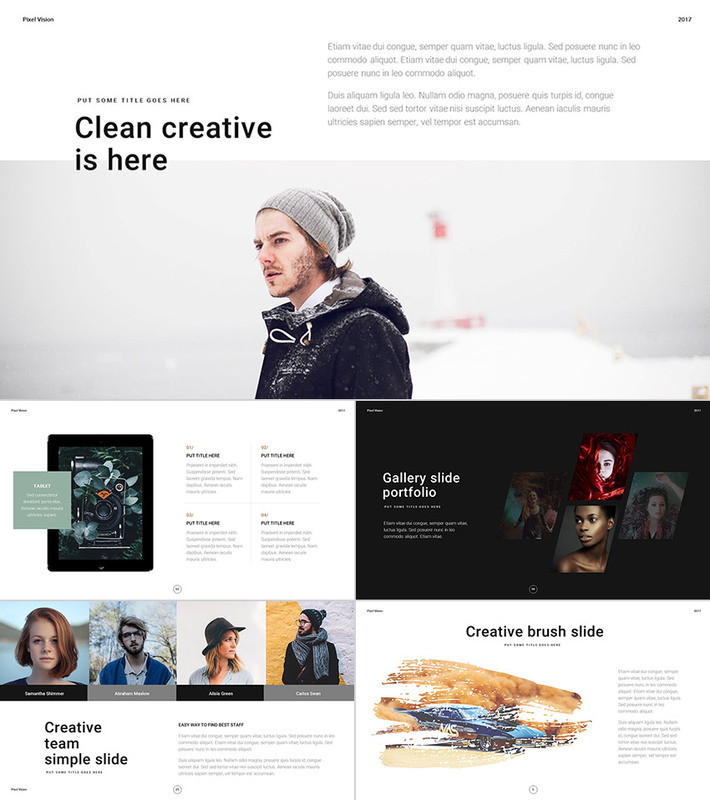 It’s overflowing with creative assets, modern features, and stylish slides. If you need to make a unique presentation—especially one that includes slides that read with clarity and energy—then use this stimulating set of slide designs to build a beautiful presentation now! 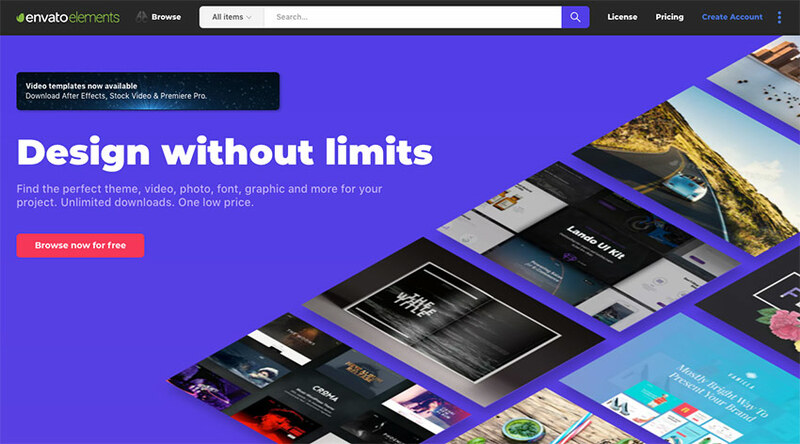 Sign up for Envato Elements and you get access to thousands of unlimited use graphics and template designs, from web themes to presentation templates, and more—all for one low price. While Envato Elements is a powerful option, if you prefer to buy new PowerPoint templates one at a time (instead of getting unlimited access to hundreds of designs), check out the selection from our GraphicRiver marketplace below. 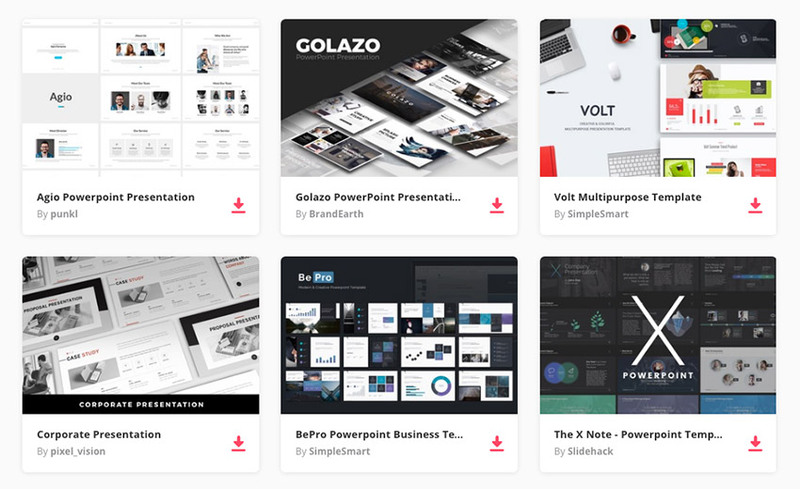 Here are the best PowerPoint presentation design templates with beautifully-crafted slide layouts, amazing graphics, and a bevy of modern options. 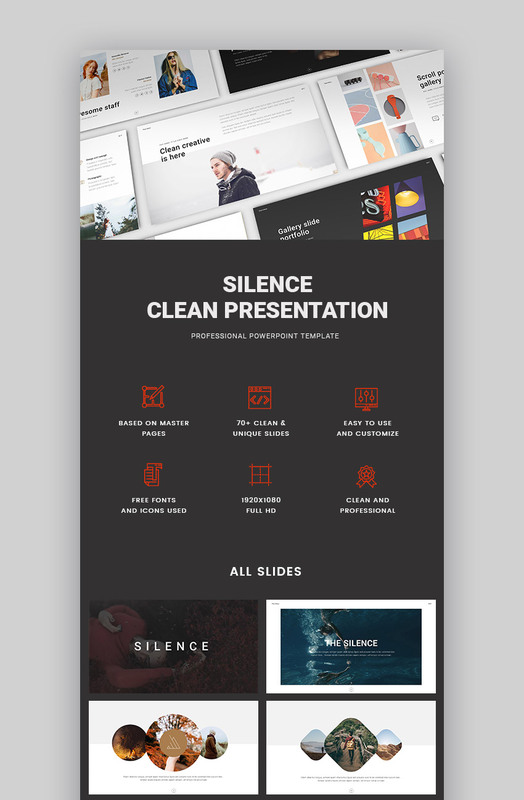 Silence – A top PowerPoint presentation template design with modern slides for 2019. 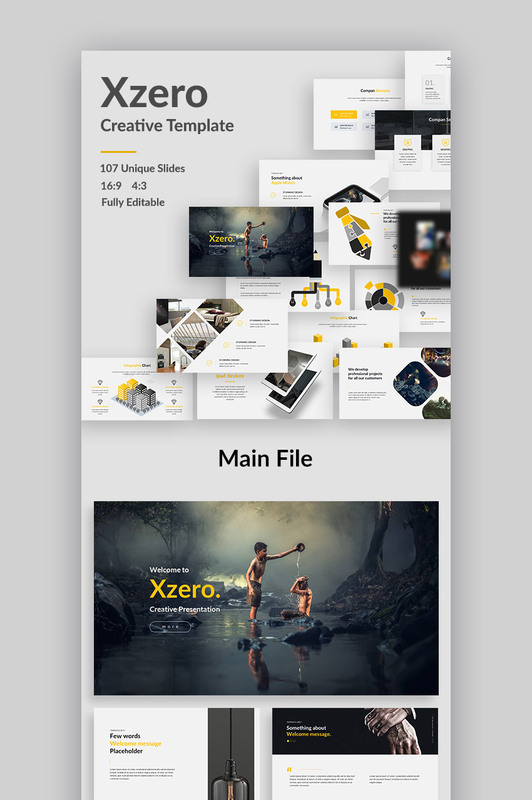 Choose one of these top PPT templates from GraphicRiver. They’re made professionally and are easy to edit, so you can quickly make a presentation that’s on-trend and is sure to wow your audience. 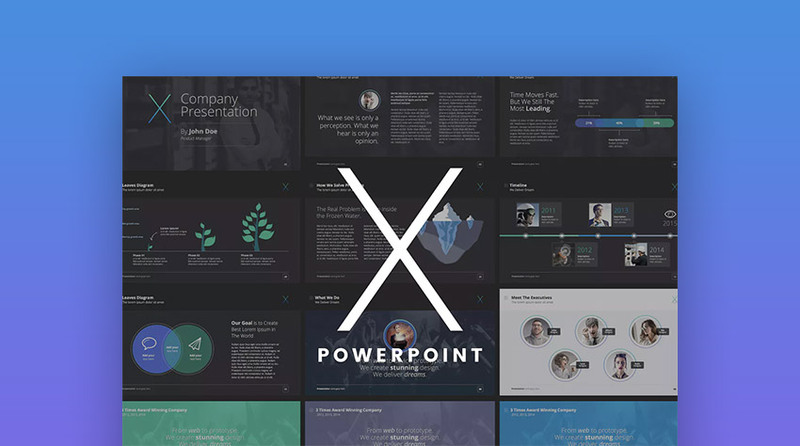 Massive X is a powerful PowerPoint presentation theme design. You can use it to build whatever type of presentation you want in 2019. Get your ideas prepped and a creative deck designed fast! 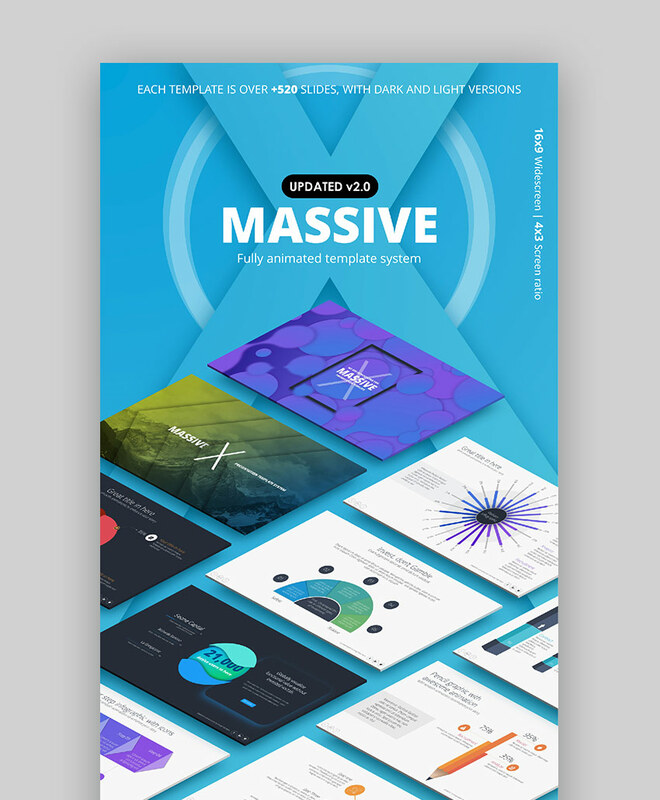 Also, as its name implies it packs in a massive number of creative assets like over 250 modern slide designs, device mockups, unique layouts, editable photo setups, dynamic infographics, and more. 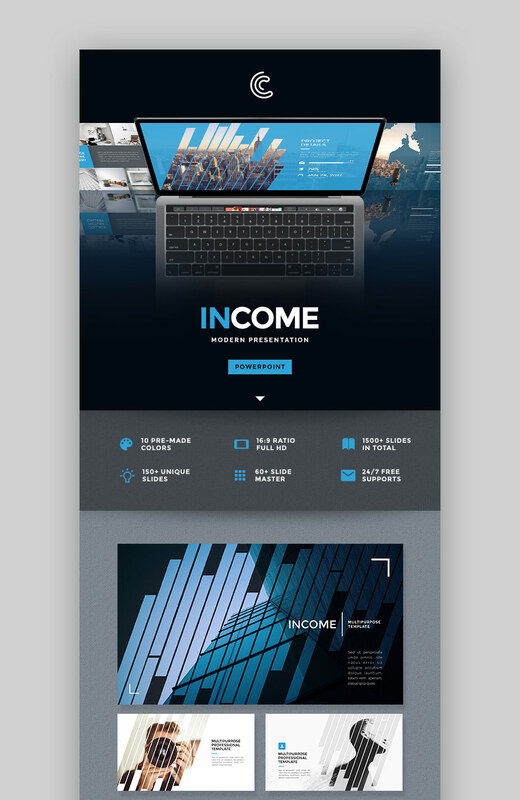 Income is a new PowerPoint presentation template that features an innovative set of slide designs made for 2019. It’s designed with a current aesthetic that arranges: clean fonts, dynamic photo placement, and bold use of diagonal shapes. 150+ unique slides with clean designs. 64+ easy-to-edit Master Slide with pro setup. 10 pre-made color templates, ready to work with. Use it to quickly make a visually engaging business presentation that’s both on-message and on-trend. Are you ready to make a great presentation? If so, then the MNML template will help. 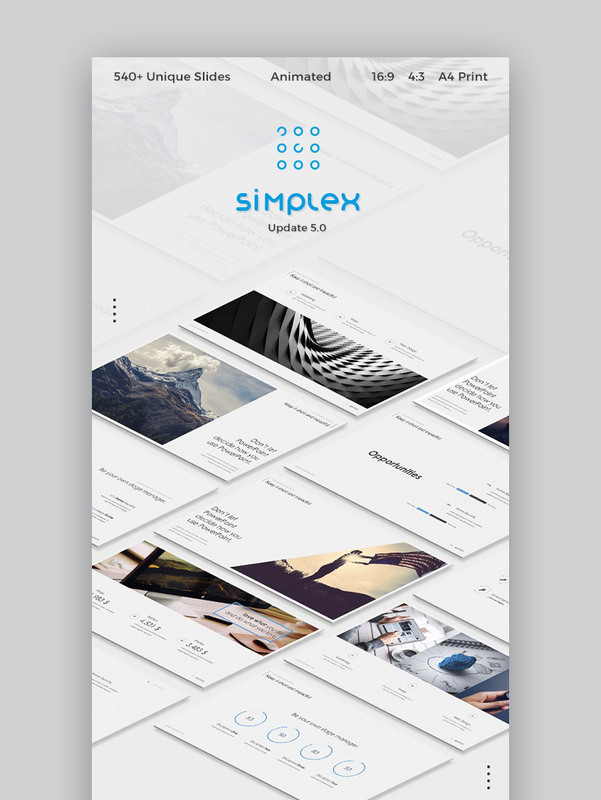 As the name implies, it features a clean, minimal style with a strong set of PowerPoint design themes. 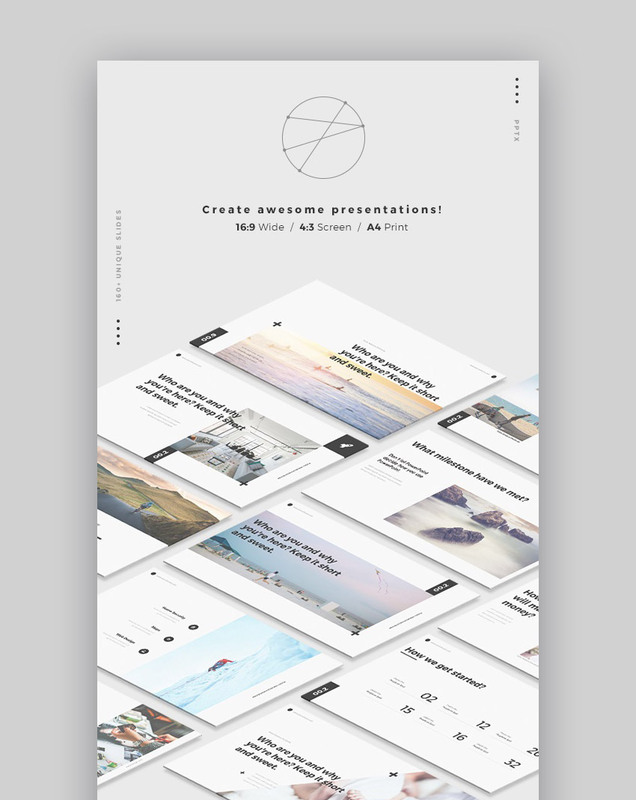 It comes with 160+ modern slides, numerous layout options, and plenty of creative assets. 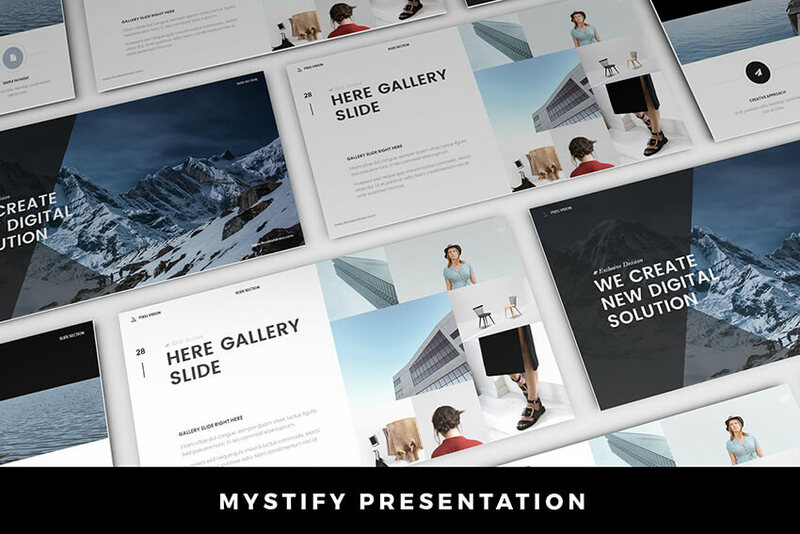 With this PPT presentation set, you can create a powerful and convincing presentation—that delivers at your best! With the Silence PowerPoint design theme, you’ve got a great set of assets to make a powerful presentation with for 2019. It has a snappy set of 70 slides that feature: clean creative layouts, bold modern colors, balanced text with shaped imagery, and plenty of white space to let your message take shape. That way, you can focus your audience’s attention, deliver your ideas with impact, and motivate them to take action. To make an effective PowerPoint presentation can be time-consuming. That’s unless you’ve got the right resource. 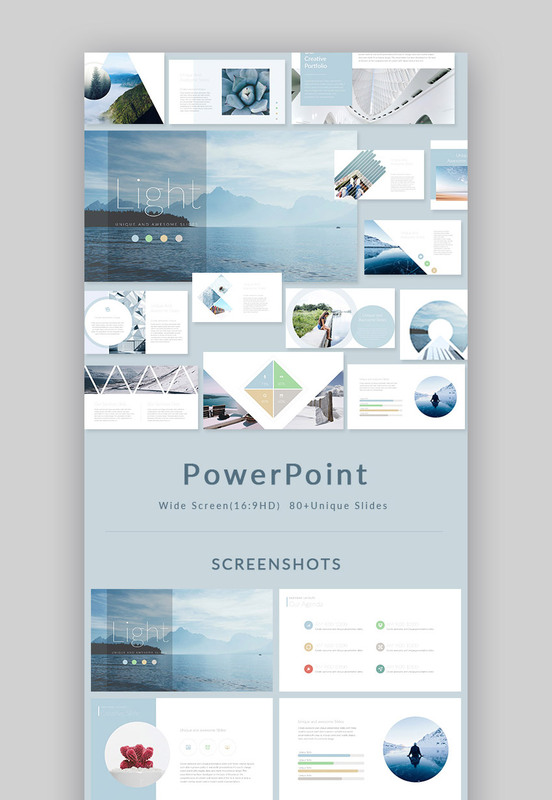 This Modern PowerPoint design template has loads of stylish slide designs, photo placeholders, ready-made infographics, and plenty more professional time savers. It’s a modern set of PPT designs that are on-trend for 2019—and ready to make your presentation with now! 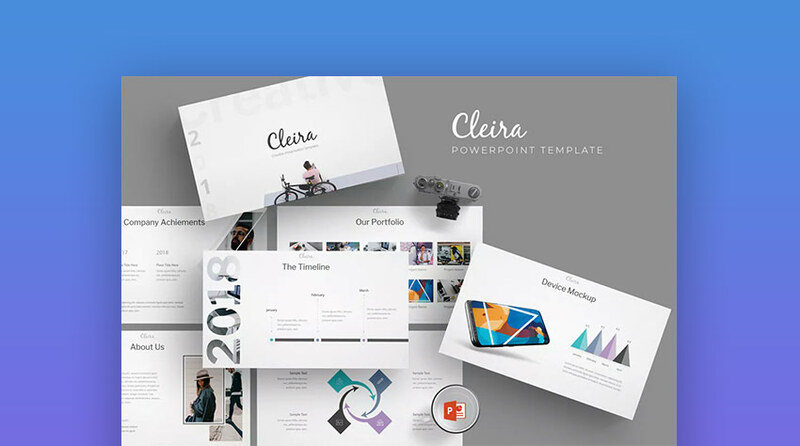 This is a top PowerPoint design theme updated in 2019 with more brand-new slide designs. This design template is now packed with 540+ modern, unique slides. They feature plenty of graphic options, from device mockups to image/text layouts and easy to edit infographics. So you can swiftly turn your ideas into a simple, elegant presentation! This is a trending designer PowerPoint template that stands out in 2019. If you want to make a presentation that has a soft, elegant feel, then the Light PPT theme has you covered. It comes with loads of modern slide layout options, and a healthy combination of text, photo, and graphics options, for quick customization. 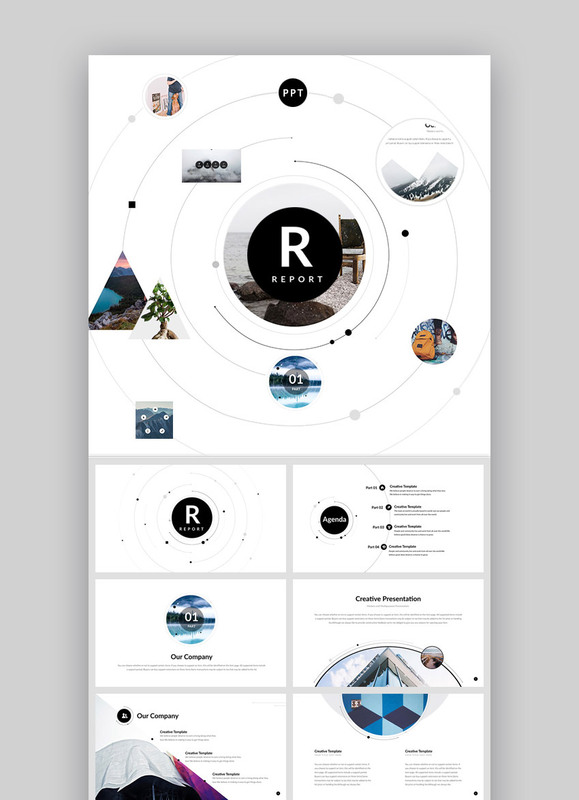 Report is a new flat design PowerPoint template made in 2019. It’s lighting up the sales charts with its clean, powerful, modern design. Featuring a dynamic use of shapes to engage the viewer, set against plenty of white space, to make your ideas stand out. It comes with, 90+ unique slides, easy to customize slide setup, animation transitions, and more. Why use free PowerPoint design templates that you can find online? Sure you can save some money, but at what cost? You want your presentation to come across as professional, current, and gripping. Not dated and dull. Fortunately, a Premium PowerPoint template like Xzero has you covered. It’s filled with the best design features, from over 100+ fresh slide designs, to fully edible professional setups, elegant animation options, clever visualizations, clear infographics, and more. This flat design PowerPoint template has colors that pop inside of spacious slide layouts. It’s set up with professional fonts, icons, and graphics. This creative set of designs is updated for 2019. Its multipurpose design is great for many presentation types: from a giving a business pitch to updating your team on current earnings, or delivering an engaging speech at the next meetup. Both GraphicRiver and Envato Elements have trendy, popular PowerPoint templates with high-quality visual designs. They lead the pack in 2019. But, should you use GraphicRiver or Envato Elements? And, what are the key benefits of each? GraphicRiver is the leading digital marketplace for purchasing single-use graphics and visual assets. It’s part of the Envato Market suite of online marketplaces that cater to numerous creative digital asset needs. Envato Elements is a little different. It’s a monthly subscription service that gives you unlimited template downloads for a single monthly fee. That’s a powerful offer. Best PowerPoint presentation design templates on Envato Elements (2019). If you’re a serial entrepreneur launching new brands regularly, a digital marketer with multiple projects to promote, or a graphic or web designer with numerous clients to serve, then Envato Elements offers a great bang for your buck. Sign up for Envato Elements now. 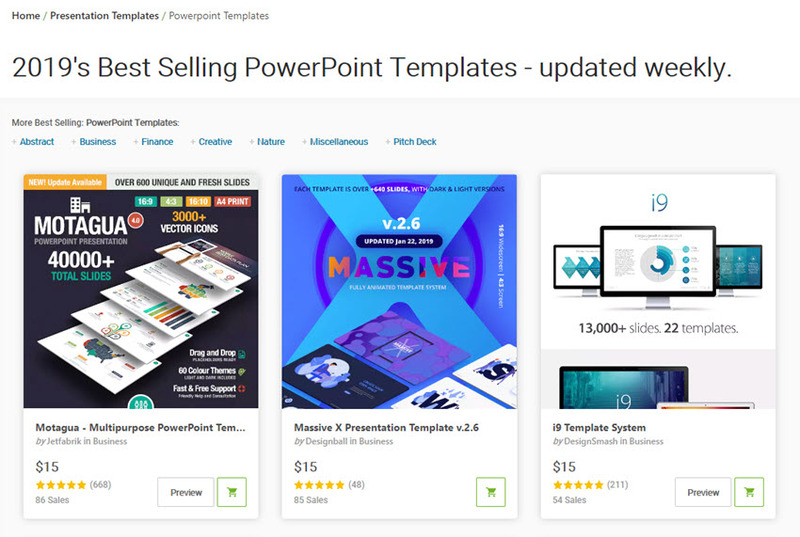 Or, if you just need a PowerPoint presentation template or another file type to download right now, then head over to GraphicRiver (or another Envato Market site) to find just what you need. If you want to make sure your presentation not only presents your ideas in a compelling manner but also gets your boss or potential business partners on board, you need to invest a little extra effort into your PowerPoint design. 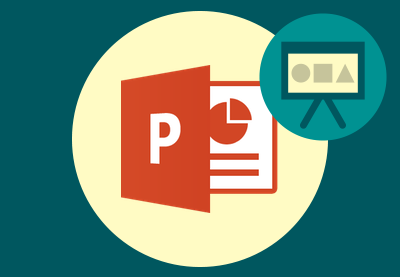 Below are five tips and ideas that’ll help you make a standout PowerPoint presentation. If you’ve got a lot of data in your presentation, make sure to illustrate those ideas and stats with charts and graphs. Not only will they be easier to visualize for your audience, but they’ll also make your presentation more interesting. When you’ve found your perfect PowerPoint template, be sure to customize it according to your needs. This allows you to maintain your brand consistency and at the same time reinforces your brand image. 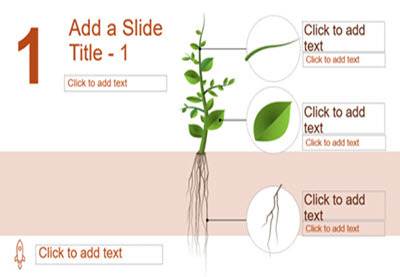 Another presentation design idea is to use animations in your PPT design. Animations can help add visual interest, especially if you use them between slides or different sections of your presentation. You can use them to signify the start of a new section or introduce new concepts. Lastly, the copy you use in your PowerPoint presentation needs to be just as interesting as the design. The copy needs to be succinct, but it also needs to be persuasive and help you successfully pitch the idea to your audience. Use clear sentences, showcase the benefits as well as the facts, and don’t forget a call to action at the end. 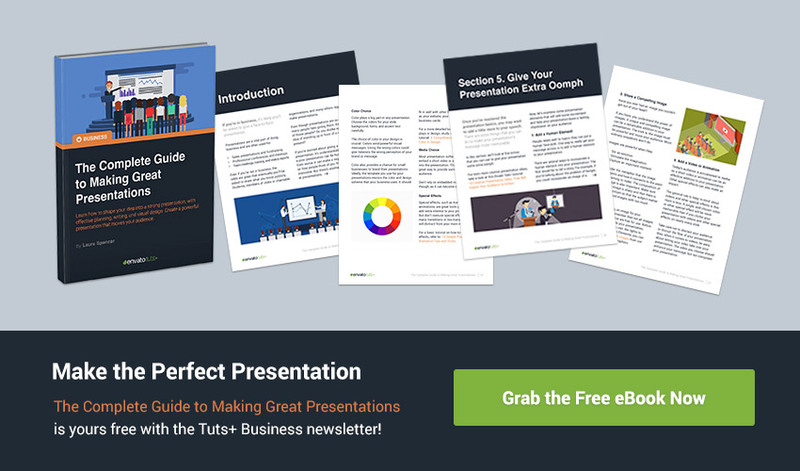 Learn the best presentation strategies in our new eBook: The Complete Guide to Making Great Presentations (grab it now for FREE). Get your ideas packaged into a powerful presentation that’ll move your audience to action. Check out the best PowerPoint templates with on-trend designs and modern features that’ll set your presentation apart. Download an inspirational presentation design now. Add your ideas to the slide layouts quickly, and customize your message to present with impact to your audience. 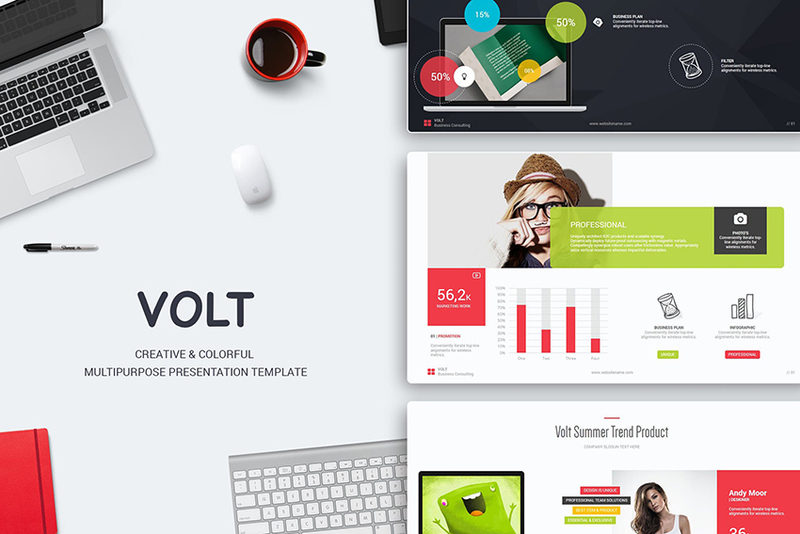 Discover more popular PowerPoint presentation design templates from Envato Elements. 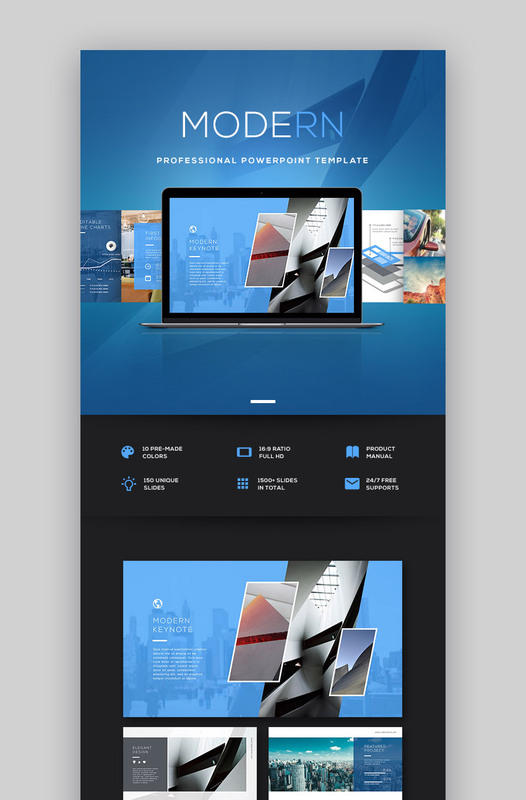 Or, browse through PPT presentation theme designs that are trending on GraphicRiver. 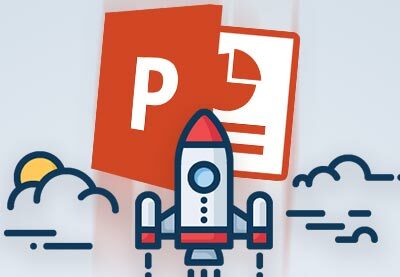 Editorial Note: Our staff updates this post regularly—adding new, inspiring PowerPoint PPT presentation templates with the best, trending designs.